Director – E.W. Swackhamer, Teleplay – Steven Bochco & Michael Kozoll, Producer – Gregory Hoblit, Photography – Dennis Dalzell, Music – Fred Karlin, Special Effects – Wayne Beauchamp, Art Direction – Jim Hulsey. Production Company – MTM Enterprises. Top San Francisco architect John Rawlins is hired by the mysterious Anton Voytek to excavate and restore the old ruined Heidecker Estate. There they uncover a vast treasure trove of artworks worth more than $25 million. When Rawlins’s wife Leslie makes the discovery that all of the artworks have been stolen over the centuries, Rawlins has no choice but to call the police. Arrested, Voytek swears vengeance. Bailed out, he turns up at Rawlins’ home and seduces Leslie. Rawlins returns home to find her dead. He becomes obsessed with revenge against Voytek. Breaking into Voytek’s apartment, he flees after discovering him sleeping in a coffin. After being placed in a psychiatric institution, he is freed by former police detective Harry Kilcoyne who believes his story because of a similar experience on the force. Together the two of them team up to eliminate the vampire menace of Voytek. The vampire film was in strong force in the 1970s, buoyed up by the success of the Hammer Dracula films. As the genre’s popularity grew, it seemed to be struggling to find ways of updating its central figure. The traditional vampire in dinner-suit and cape seemed at odds with the modern day as was shown to comic effect in films such as Count Yorga, Vampire (1970) and Love at First Bite (1979), while various attempts to update the vampire – the tv series Dark Shadows (1966-70), Hammer’s Dracula A.D. 1972 (1972) and The Satanic Rites of Dracula (1973) – only ended up transposing the figure into the present cape and all and making it more than clear that the classic vampire was an anachronism. It was not until The Night Stalker (1972) and then George Romero’s remarkable Martin (1976) that the vampire started to get a foothold on the modern world. By the late 1970s, you could say that the vampire had made the adjustment. 1979 was a year that the vampire film hit a peak for the decade and screens were deluged with a series of new takes. These included the lush Frank Langella remake of Dracula (1979), Werner Herzog’s remake of Nosferatu the Vampyre (1979), the tv mini-series of Stephen King’s Salem’s Lot (1979), the Australian medical vampire film Thirst (1979) and the comedic likes of Dracula Blows His Cool (1979), Love at First Bite and Nocturna: Dracula’s Granddaughter (1979). Looking at the credits for Vampire makes your mind boggle – a vampire film from Steven Bochco and Michael Kozoll!!! – none other than the creators of Hill Street Blues (1981-7), which I would argue is the greatest tv cop show ever made. At the time that he made Vampire, Steven Bochco was working as a writer for hire, including turning in the screenplay for Silent Running (1972) and creating the David McCallum tv series The Invisible Man (1975-6). Ahead would be his creating/producing classic shows such as L.A. Law (1986-94), Hooperman (1987-9), Doogie Howser M.D. (1989-93), NYPD Blue (1993-2005) and Murder One (1995-7). The credits for Vampire read like a checklist of some of the essential people behind Hill Street Blues – Bochco, Kozoll, Gregory Hoblit and David Anspaugh. The show is even produced by MTM Enterprises, the production company set up by Mary Tyler Moore, which was behind Hill Street and numerous classic shows of the era such as The Bob Newhart Show (1972-8), Lou Grant (1977-82), WKRP in Cincinnati (1978-82), Remington Steele (1982-7) and St Elsewhere (1982-8) – although unlike the other MTM shows, the company’s cat logo at the end, which would sprout a surgical mask or police cap depending on the show, fails to develop a pair of fangs as you half expected it to. With many of the essential creative figures behind Hill Street Blues present, you expected Steven Bochco and co to do something amazing with the vampire genre. As mentioned, the vampire films of the early 1970s were always vexed with the problem of how to modernise the vampire. Vampire is one of these that simply fails to address the question at all. 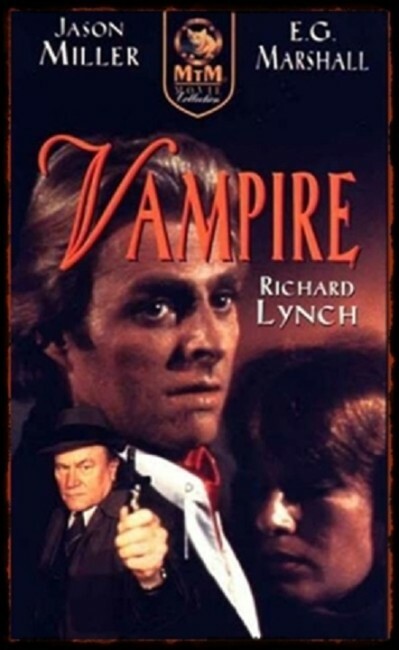 Richard Lynch just looks aristocratic and wealthy, while dressing in a red-lined cape – in other words, the film’s conception of the vampire still draws on Bela Lugosi and shows the vampire doing little to move beyond this to embrace the modern day. This is largely Vampire‘s problem – and almost certainly one of the reasons that it failed to go to series – it stays with the tried and true, never does anything clever to show the vampire coming up against the modern day as The Night Stalker did. Indeed, there is nothing exceptional to Vampire as a film. Richard Lynch’s Voytek has more personality than Barry Atwater in The Night Stalker and is certainly a more engaged modern vampire than say Dracula was in Dracula A.D. 1972 – but not that much. We never see him drinking blood, for one. The other flaw of the show is that E.W. Swackhamer’s workmanlike and dull direction – he fails to give much excitement to the proceedings. The story is also frustratingly open-ended, clearly left so for a series that never emerged, thus there is no big confrontation with Richard Lynch who escapes before they can stake him. Even then, the vampire seems such a cutout menace that it is hard to imagine it would have ever been a very interesting series. Certainly, the casting of Jason Miller and E.G. Marshall as the vampire hunters propels Vampire out of B movie stakes. Miller, none other than the priest from The Exorcist (1973), seems to radiate a moral determination and beagle-like sorrow from his every pore, while Marshall gives a fine airing to the role of a old school detective. 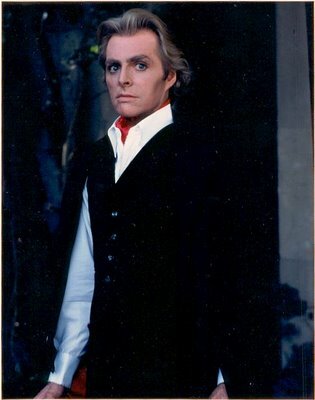 The vampire is cast with Richard Lynch, who developed a substantial career playing villains in tv series and B movies from the 1960s through to his death in 2012. Cast here just before he started to gain a name for himself in the 1980s, Lynch looks handsome, is very sharply dressed and creates great presence – the film’s failing is to ever give him much to do. There is also Kathryn Harrold, another actress who was cast just before she was coming to be known. You get to see her looking young, gorgeous – and for added bonus staked as a vampire. (Although the odd thing that is never shown is her initial death – we see Richard Lynch entering the house and seducing her and then cut to husband Jason Miller’s shocked and upset reaction after he returns but exactly what happened to her is not clear. Given the psychic weight this adds in terms of providing his motivation, it seems an odd omission). Playing a detective, you can also spot Michael Tucker, later one of the regulars on Bochco’s L.A. Law. E.W. Swackhamer was a director who worked almost entirely in television between the 1960s and his death in 1994, directing many episodes of classic series. His other genre works include the Hollywood ghost story tv movie Death at Love House (1976); Spider-Man (1977), the pilot for the Nicholas Hammond tv series that was theatrically released outside the US; The Death of Ocean View Park (1979) about a haunted amusement park; and the tv movie Bridge Across Time (1985) featuring a resurrected Jack the Ripper.